The Royal Horticultural Society (RHS) has awarded 154 prestigious medals to the gardens, floristry and floral and plant exhibitors at this year’s RHS Hampton Court Palace Flower Show, sponsored by Viking Cruises. In addition to 64 Gold Medals, 38 Silver-Gilt Medals, 42 Silver Medals and nine Bronze Medals were also awarded across the world’s largest annual Flower Show, which runs from 2-8 July. 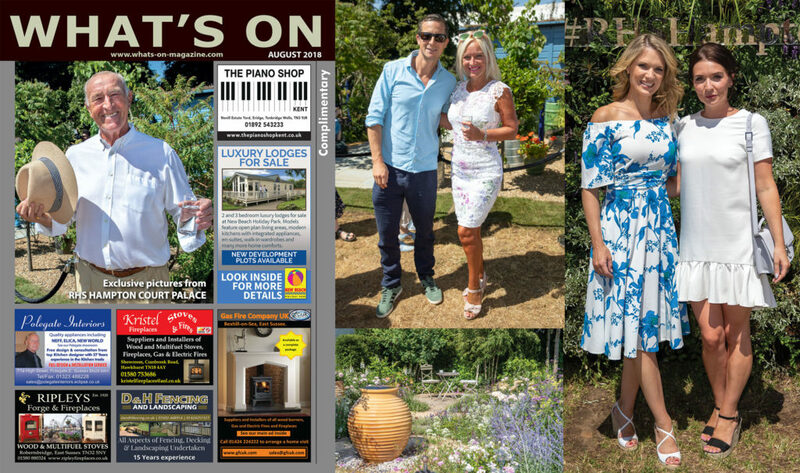 Two coveted titles were presented to the eye-catching ‘B&Q Bursting Busy Lizzie Garden’, with surrey based designer Matthew Childs earning Best Show Garden and contractors Tecwyn Evans scooping the award for Best Construction. Created using a range of affordable B&Q products, the garden demonstrates an inspirational and achievable space to entertain, with powerful injections of colour provided by the new breed of Busy Lizzies at its heart. Other gardens among the Gold Medal winners included ‘The Landform Garden Bar’ by Rhiannon Williams, ‘The South West Water Green Garden’ by Tom Simpson and the ‘Breckland Beauty Garden’ by Jody Lingard, Nick Fryer and Tim Lingard. Also awarded Gold was the ‘Best of Both Worlds Garden’, designed by Rosemary Coldstream and built alongside students and apprentices. Best in Show in the brand new Lifestyle Gardens category was awarded to Ula Maria for ‘The Style and Design Garden’, while Joseph Gibson secured the Gardens for a Changing World accolade for ‘Conscious Consumerism’, and the ‘Santa Rita: Living La Vida 120 Garden’ by Alan Rudden won Best World Garden. A total of 54 Gold Medals were presented to nurseries in the Floral Marquee, as well as 29 Silver-Gilt, 21 Silver and two Bronze medals. Cook’s Garden Centre, Lime Cross Nursery and Southfield Nurseries were among the Gold Medal winners, and the prestigious Best Exhibit in the Floral Marquee went to Roualeyn Fuchsias. Also scoring well, the Allium National Collection was awarded Best Plant Heritage Exhibit and David Austin Roses took the title for Best Rose Exhibit. Adding to the accolades, Best Dig In Exhibit went to Pennard Plants, Best Exhibit in the Floral Design Studio was awarded to Somerset Postal Flowers and Lauren Easter from Hadlow College was named RHS Future Florist of the Year. The Best Flower & Vegetable Box Award was given to the Herbs and Preserves Garden – An Ode to Antiquity for their flower box celebrating the ancient tradition of flavouring and preserving food with herbs with the hopes of inspiring today’s population to address food waste.